No soon do we read in the Telegraph that Mauricio Pochettino has “hinted” at his imminent departure from Spurs – which he sort of did and sort of didn’t – than the Independent says his club will spend – get his – “at least £120m” on new players this summer. The player the Indy “understands” Sours will buy are Newcastle United’s Jamaal Lascelles, Ajax’s Matthijs de Ligt, Crystal Palace’s Wilfried Zaha, and West Brom pair Jonny Evans and Jay Rodriguez. All are being “considered”. And where are they all going to play, then? This is utter guff from the Indy, which cites not a single source for its story. The Indy reasons that Spurs will balance he books with the sale of Toby Alderweireld. 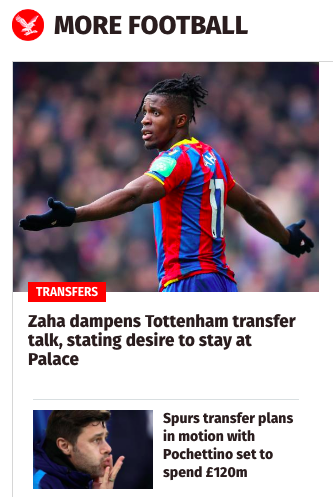 The Indy’s shameless clickbaiting is lampooned by its own lay-out: Zaha stays!